Like an egg, but not. Sometimes you find yourself walking around the streets of Ho Chi Minh City (formerly Saigon) late at night trying to find a restaurant that tourists wouldn’t go to. What we found was Le La Quan, a place so local that the people who worked in the restaurant barely spoke a word of English and the menu was only available in Vietnamese. Sometimes life gives you a difficult decision. And sometimes there is no “right” choice. Case in point: On what felt like basically the hottest day ever in Hue, Vietnam, we were given the choice of eating in a somewhat touristy restaurant with air conditioning or an “off the beaten path” restaurant without. 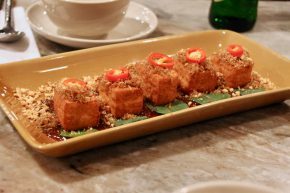 We chose the former and found ourselves at Y Thao Garden Restaurant. And of course, within minutes of setting food, having not eaten a bite, we all felt like we had made the right decision. Hoi An might be one of the coolest little towns in the world. It reminded me of the water towns not far from Shanghai, except with a modern touch that seems to blend seamlessly with the old. 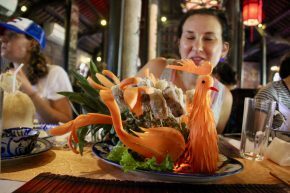 And like any cool little town worth its salt, Hoi An has a couple of dishes that claim to be indigenous to the town. 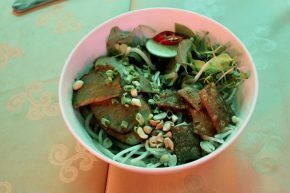 As such, we made our way to Green Heaven in Hoi An to try out the goods. Somehow it starts with tofu. The historical interrelationships of Southeast Asian countries is fascinating, especially for those in the Indochina parts. Amazingly, they have each maintained such strong individual cultures and that is no more apparent than in the food. You see, after some time in Vietnam a few of us were tired of Vietnamese food. So, obviously we wanted a burger or a burrito or pizza? Right? Wrong. We went for Thai food at a place called Tuk Tuk. Fast food is an amazing thing. And what’s more amazing is that soup is kind of the original fast food. Sure, it has to be prepared way in advance, but once that is done a meal is just a scoop away. 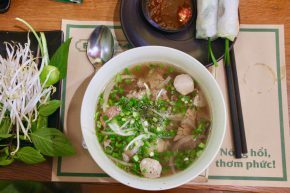 Pho 24 has elevated the combination of fast food and soup to an art. It can be found in Vietnam, a number of Asian countries and even as far away as Australia and I paid a visit to one in Ho Chi Minh City (formerly Saigon). I have a confession to make: I don’t understand why people love banh mis so much. Maybe it’s because they are one of the only options out there where people can eat Asian food and sandwiches at the same time. 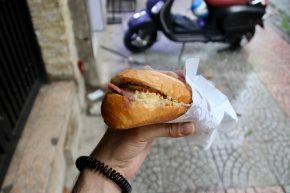 Thus, when I took a stroll over to My Banh Mi in Ho Chi Minh City (formerly known as Saigon), I opted for something a little different instead. Or is it a pitaya? If you saw something like this growing in the wild would your first thought be to eat it? Mine wouldn’t be, but I would regret that decision because this here is a dragon fruit. 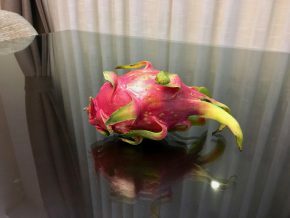 Originally from the Americas, the dragon fruit has somehow become a fruit much more associated with Southeast Asia. And while it is striking on the outside, it’s even more striking what it looks like on the inside. 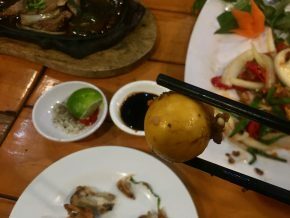 A recent joint Australian-Vietnamese study found that people who eat meat have stronger bones, and who are we to question the Australians and Vietnamese? 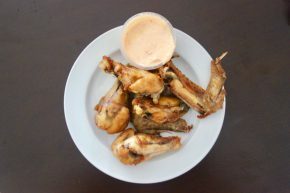 According to the study, “vegetarians had bones five percent less dense than meat-eaters.” It was even worse for vegans.